You can see that SpringAhead still has their blog feed on their homepage. SpringAhead provides time tracking software for businesses. It appears that they have a successful business that has been growing over the last several years. It also appears that one of their marketing strategies was blogging. They started their blog back in 2010. The blogging continued for a steady clip all the way into 2014 when it came to a halt. That’s not uncommon. It takes commitment along with a good strategy for business blogging to work. And it’s usually more effort than first assumed. As a result, it’s common to see business blogs without posts for months and years even if they still have their blog feed on their homepage. Let’s look a little deeper into the good things SpringAhead was doing and perhaps some things they could do well in the future. Let’s start out by looking at the sidebar. You’ll see the big list of archived post listed by date. We saw that earlier, but just below that you’ll see a list of categories. And I think SpringAhead has some good categories. Their target customer is a business that needs time tracking software to better manage employees and freelancers. With that in mind it makes sense to have categories like Accounting. And if they are focused on SaaS customers it’s good to have that category. Then they also have company news and events. The Uncategorized category can look a little messy on a business blog, but it looks like that one was supposed to be Cloud Computing. SpringAhead has good things here. When we create categories for clients we look at the target customer or reader. We consider the industry and who the exact reader is and how their life is affected by that industry, their job and their life in general. The last post from 2014 by SpringAhead is a notice about an open position at their company. I’ve always thought this is a great idea for a post. It’s something people are interested in when it comes to the industry and even if you’re target readers are your clients they can see that you’re hiring (and likely growing). They also likely know others in the industry and might know someone that could fill the position. You maybe don’t want to go overboard with these posts, but if you keep up with other types of posts you could post all the new job openings on your business blog. It looks like at some point that SpringAhead had a merger with another company, Bullhorn. That’s major company news and that’s certainly something to share on a company blog. It looks like SpringAhead has done that with a few posts. I like what they did with this post when they discussed an aspect of their business and customers. When things change, customers immediately wonder how it affects them. So it’s good for the company to reassure customers that things will not change or that they will change if they are going to change. People aren’t always acceptive of change, but they’re more likely to get over the change if they have a clear direction on how to move forward. It’s hard for people to not know what’s coming in their future. Here’s an example of a post where SpringAhead does a great job of using screenshots. And they’ve done it with multiple posts on their blog. When you’re talking about software updates it’s good to use screenshots. It gives readers a visual on exactly what is changing and how things will work going forward. That gets back to the idea that people can get nervous about change and giving them information about how to move forward is always good. You can use screenshots in blog posts in that way and you can use them in other types of posts as well. Let’s say you’re talking about other software tools, complementary tools, that your readers would find interesting and useful. You can use screenshots then. You can use them in case study posts to show how you’ve helped clients and in other ways. And building on that let’s talk about some other types of posts that most companies can do including SpringAhead. We like to look at blogging as being the first point of contact for target customers. They haven’t discovered your brand yet. If they did they would find your homepage and by that point you’d want to move them through your sales process. They’re past the point of needing to read blog posts for the most part. So with that in mind it’s fine to write about specific changes to your company, but only as part of a blogging strategy. If you think about your target customer and their life you’d know that they’re not spending much of their time thinking about your company. They have other things going on that affect their job and their life. Find the questions your target customers have as it relates to their job and to their life. Some will be specific to your brand. Some will be specific to your industry and some will be more general and about their life. All are still relevant because if you know your target customer you can attract them and earn their trust by answering their questions and when they are in the mind frame of wanting to know about your business they can move to the main pages on your site and into your sales funnel. 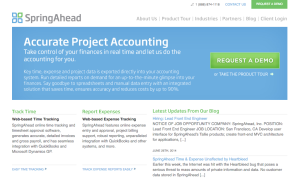 SpringAhead seems to have a really cool software product and business. They’ve been doing a lot of things over the last few years it seems to grow and do well with their customers. And they earlier committed to blogging, but haven’t for a few years. But they have the opportunity to get back into it. We’ll have to see if they do.